Users from around the world are updating their devices to Apple's latest iOS 7, which was released on Wednesday, with nearly 32 percent of North American iOS web-based traffic coming from the new operating system. 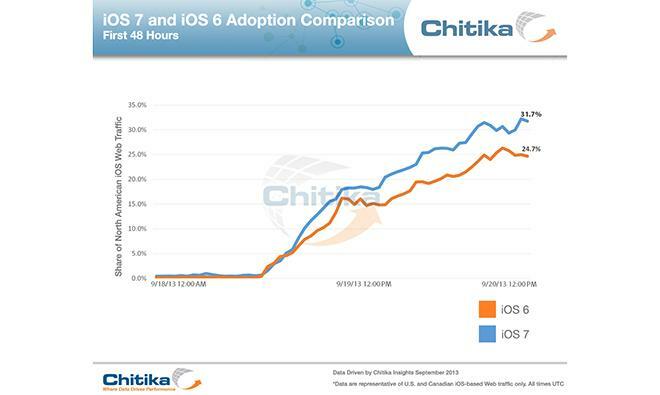 In an update to a report released earlier this week, ad network Chitika on Friday said that iOS 7 accounted for 31.7 percent of iOS traffic 48 hours after release, while iOS 6 took only 24.7 percent during its first two days of availability. By comparison, it took approximately three days for the last iteration of iOS to cross the 30 percent mark when it debuted in 2012. The data comes from Chitika Insights, which sampled millions of North American iOS-based online ad impressions from Sept. 18 to Sept. 19. A growth rate was extracted from the raw data and subsequently illustrated in the graph above. Apple's iOS 7 represents one of the biggest changes to the company's mobile platform in years, with sweeping redesigns and backend enhancements tailored to take advantage of the iPhone 5s and future hardware. With a "flat" design and clever use of transparencies, Apple has created an OS that delivers a sense of depth while maintaining a clear, unobtrusive user interface. App developers are also getting in on the iOS 7 action by releasing updates to their own titles, from redesigned icons to fully revamped UIs. In addition, some apps like Infinity Blade III, take advantage of the new 64-bit A7 SoC found in the iPhone 5s, which allows greater performance and increased efficiency. Aside from third-party apps, a number of new features have been built into the core system, including peer-to-peer networking via AirDrop and usability tweaks like blocking calls, texts and FaceTime requests from individual numbers. For more information on iOS 7's new feature set, visit AppleInsider ongoing iOS 7 Feature Focus series.